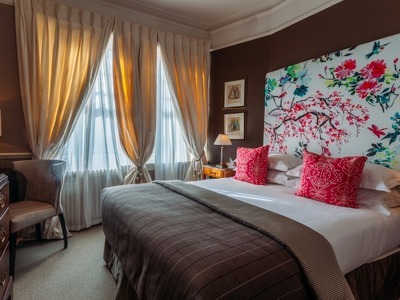 Rich in colour and comfort, the 56 rooms & suites at 11 Cadogan Gardens are plush and luxurious. Complimentary WiFi is available throughout the rooms and the hotel. Some of the rooms have the option of an extra children's bed. 1 queen-size bed, sleeping 2 people. These rooms are ideal for business stays or short shopping trip. No extra bed possible. The marble bathroom is en-suite. 1 king-size bed or twins on request, sleeping 2 people. The Deluxe King Rooms are perfect for a couple or two friends. 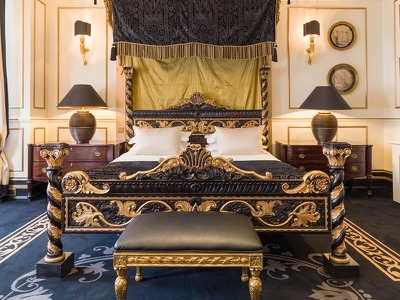 Lavishly decorated, they feature the finest bed linen and exquisite marble bathrooms. Please request twin beds prior to your arrival. No extra bed possible. Nespresso machine. 1 queen-size bed or twins, sleeping 2 people, an extra bed can be added. The Junior Suites are spacious and perfect for a couple after a little more space or a family. Bright and airy, with their own sitting areas and comfy sofas, these rooms are a welcome oasis at the end of a busy day. Nespresso machine. 1 four-poster or king-size bed, sleeping 2 people. An extra children's bed can be added. These suites are an ideal choice for a longer stay and for guests looking for a room with character. They have a comfortable seating area with sofas and armchairs for relaxation and a luxurious marble en-suite bathroom. An iPad is at your disposal during your stay. 1 king-size bed, sleeping 2 people, an extra bed can be added. 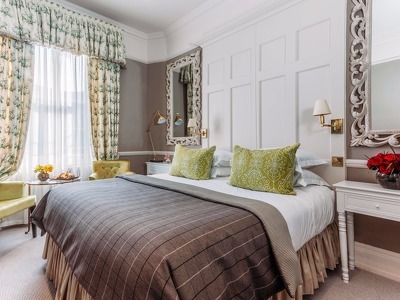 The Cadogan Suites are bursting with character and luxury. Four of them are at the rear of the hotel in the original mews buildings and have their own private entrances. With a separate living room furnished with sumptuous fabrics, guests have plenty of space to relax. There is also the option of adding a single roll-away bed, making these Suites perfect for families wanting an exceptional hotel experience. The marble en-suite bathrooms have bath and shower. Nespresso machine. 1 four-poster bed, sleeping 2 people. An extra bed can be added. 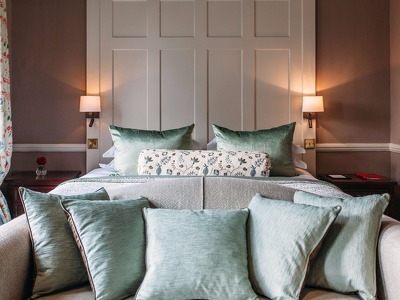 For the ultimate hotel experience look no further than the sublime Sloane Suite. Located on the first floor, this exceptional Suite, with antique furniture and floor to ceiling windows, enjoys stunning views over the leafy Cadogan Gardens. This suite is a veritable home from home with a restful sitting area and a selection of large, comfy armchairs and writing desk. Nespresso machine. 1 small double, sleeping one person. Peaceful and quiet, these Single Rooms are perfect for a short business stay. No extra bed possible. Single occupancy only. 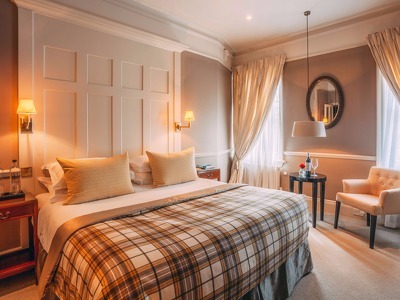 Stay in a luxuriously unique suites for a minimum of two nights and enjoy 20% off the best available room rate and a full English breakfast for two people each morning. 11 Cadogan Gardens was built by Lord Chelsea in 1887 and is now a luxury boutique hotel with 56 rooms in Knightsbridge, London. Just a few minutes walk from the designer shops of Sloane Street and even less from those on Pavilion Road, this enchanting Chic Retreat is one of our favourite city hideaways where children are welcome. Service is the name of the game at 11 Cadogan Gardens where the Concierge team are led by Head Concierge Richie Long. They wear their Clefs d'Or proudly on their lapels, telling you at a glance their depth of knowledge and expertise of the city. Whether you're looking for a Bikram Yoga class, a vegan restaurant or the best sushi bar, they can advise almost at the drop of a hat. Looking for a bit of peace and quiet? Head to the Library with its collection of antique books and comfy chairs - the ambiance is one of old world charm. Should the sun be shining venture out on to the Terrace to soak up the sun, read the paper or enjoy a glass of Prosecco. Gin lovers may be interested to know that there is a Ginspired cocktail menu, in partnership with Sipsmith London, available on the Terrace from 4.00pm-11.00pm daily during the summer. On cooler days the Conservatory provides the perfect solution for a light-filled room without the chill factor. Named after Cadogan family ascendant Sir Hans Sloane, the newly opened Hans' Bar & Grill offers a beautifully executed, all-day seasonal menu with a focus on British produce. A generous breakfast is served each morning, featuring all the classics from granola and fruit through to heartier cooked fare with an additional brunch menu come the weekend. The à la carte menu is well worth a look for lunch and dinner and the elegant and contemporary space offers the perfect spot for a cocktail, come evening. We think you'd be mad to miss out on the Afternoon Tea, a quintessentially British experience with a few quirky twists. Served from 2.30-6pm every day in the Drawing Room, it's the perfect way to rest your weary legs after a morning of shopping or sightseeing. You might prefer to head to the elegant cocktail bar for a pick-me-up, a glass of champagne or house cocktail. The bar is theatrical and dramatic and is the perfect spot to end your evening. Flexible cancellation policy: If cancelled before 12 noon, 24 hours prior to arrival, no cancellation charge will occur. If cancelled after 12 noon, 24 hours prior to arrival, the first night will be charged as a cancellation penalty. Advance Purchase Policy: Non-refundable, non-amendable and non-transferable. We decided to stay at the Cadogan Gardens for two nights in the signature suite and it was amazing. Room was extremely comfortable and bright (you have sun nearly the whole day), couldn't have been better. The service in the hotel was really good and we felt welcomed every time we walked back in the hotel. The structure is just a few steps away from Sloane Square, and the whole neighborhood is elegant, clean and classy. We didn't dine nor had breakfast in the hotel. A lovely hotel giving a fabulous afternoon tea experience. A quiet room with background music. The food was beautifully displayed on individual tiered cake display. We were given top ups of our tea and left to enjoy and chat the afternoon away! My home in London. At least, that's what I feel every time I go here. The staff is friendly and have a very personal approach. And it is a joy that there is one hotel living up to the old standards. For me, this intimate and friendly hotel is the way to live, not in one of the cold, modern places where you get service from drones. If you, like me, are an Anglophile, this is the place for you. 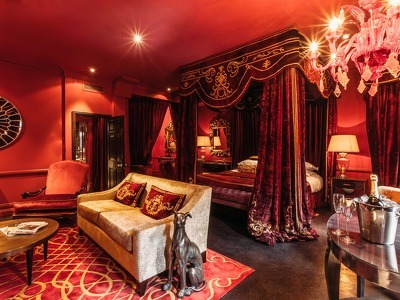 This is the perfect London hotel. 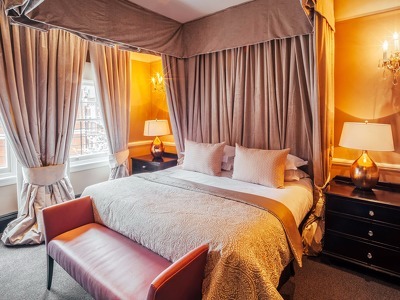 Very close to Sloane Square and the tube station, so it is a great launching pad for touring the city. The rooms are newly decorated, beautiful and very spacious. The new restaurant is very stylish, and the food is really good. There are two bars, one attached to the restaurant, and another off the lobby. It is very comfortable with nice couches. But what sets this place apart from any other hotel in London is the warm friendly service. Everyone treats you like an old friend. The head concierge, Richie Long is a side splitting hilarious guy, and is the best in the business. His personality has pervaded the entire front office staff, because they are friendly and funny in a decidedly unpretentious way. This was our second visit and my only regret is that we couldn’t stay longer.